OK, this time I am really selling the bike. I really don't want to but I need more room in the garage for the next bike project. I replaced the handlebars and took it for a spin the other day and it's really a solid bike, just too small for me. I am not sure about the frame sizes, maybe it's the stem, but the Bianchi just feels bigger than the Cannondale. I hate to let it go but I don't think it's going to get the use it deserves. I put it up on Craigslist this morning and not fifteen minutes later, I got a response! Unfortunately, whether or not he is legitimate, there is no way I am schlepping this into the city. I wrote back to him telling him the bike is in Connecticut. 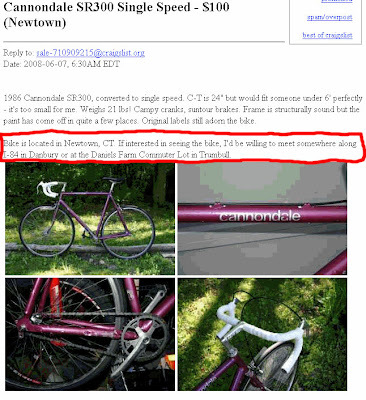 In fact, I went back and edited the ad to add a little more information on where the bike is and where it can be seen.